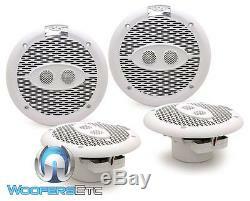 2 Pairs M162C - Rockford Fosgate 6.5 75W RMS 3-Way Marine Speakers. 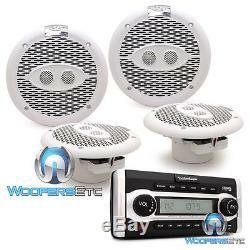 6.5 3-way White Marine Speakers. Peak: 600 watts per pair / 300 watts each. RMS: 300 watts per pair / 150 watts each. 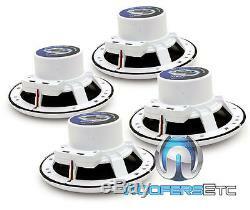 Dual 3/4 Titanium dome tweeters. Single line LCD text display. 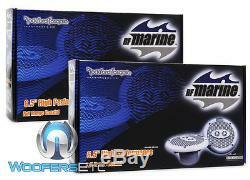 Marine certified for use on boats and other marine vessels. Peak: 40 watts x 4 channels. RMS: 17 watts x 4 channels. MP3 ID3 Tag Display (Title/Artist/Album). Playback of CD, CD-R, CD-RW, MP3, and WMA. 3 Sets of 2V preamp outputs (front, rear and subwoofer). IPod/iPhone Ready: Adapter required and included for iPod connection. Rear USB port for connection to digital media devices such as flash drives, thumbs drives. 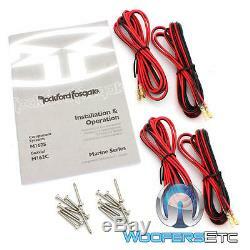 Rear auxiliary input: RCA Audio Input. Front SD and MMC card reader for playback of digital media files. You will be issued a Return Authorization Number. In order to maintain an inventory of 100%, Brand New, A-Stock, untouched products, all sales are final. We ask that you please be sure you are ordering the correct product. 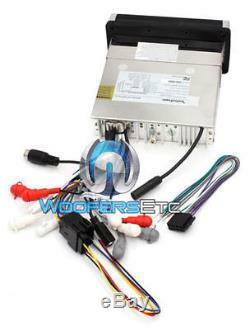 The item "Pkg 2 sets ROCKFORD FOSGATE M162C 6.5 MARINE SPEAKERS + RFX9700CD BOAT STEREO" is in sale since Wednesday, August 6, 2014.